Nick O’Neil does a great job explaining how Forbes.com captured 680,000 page views by posting a summary of a long article that appeared in The New York Times. And nearly every day, websites are summarizing articles and interviews that appear on other news sources. Today, I was surprised to see The Wall Street Journal blog it’s own article about KeepRecipes.com. Upon reflection, I think this might be a great idea for news sites that do long form journalism. 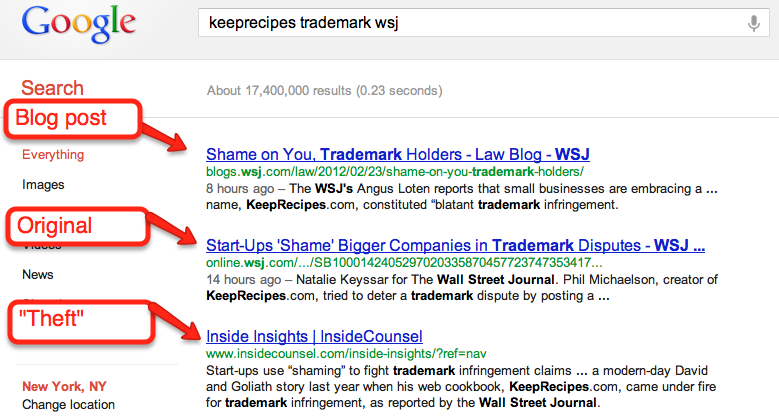 Google search results now show up to 4 articles from the same domain. So, the publisher can aim for all 4, or at least the top 2, which get the overwhelming majority of clicks. If the publisher is big enough to get shares and links for both the blog post and summary, and has a high page rank, it will likely get the top 2 search results. The primary negative of having both an long form article and a blog post is that the blog post could steal some inbound links, social mentions, and comments from the long form article, hurting is ranking in Google search results. However, the publisher can not only get two listings but also cater to two audiences–(1) those who want a summary; and, (2) those who want long form research. I personally never use cnn.com because the “story highlights” bullet points make me feel silly. And I don’t like Huffington Post because it often summarizes news elsewhere, which I then have to go read. But the idea of a trusted source doing a summary and a long form makes a lot of sense to me. Interestingly, the blog post on the WSJ has a better ranking in Google, perhaps because its link structure includes keywords. Most importantly, the blog article and the original article appear in the results above an article that mostly summarizes the original piece (though I must thank them for a kind summary and link). Should news outlets blog and summarize their own articles? Phil Michaelson helps recipe organizers, interior designers, brides, and travelling foodies.